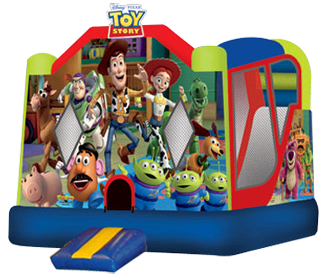 Join Buzz Lightyear, Woody and the Toy Story gang in The 4 N 1 Toy Story themed Inflatable Combo! A 10' x 18' jumping area!, a Basketball Hoop for games, a really tall climber and a surprisingly steep slide all add up to a truly successful (and pretty easy) party. Our 4N1 Combo has been the highlight of 1,000's of Backyard Birthdays, School Events, Picnics, Carnivals and Fairs simply because it's Really, Really Fun!